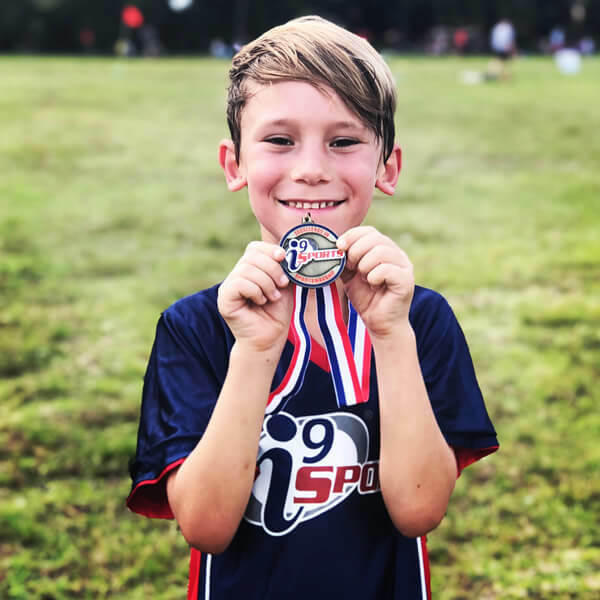 Based in Tampa, Florida, i9 Sports® is the nation’s first and largest youth sports league franchise business* with more than 2 million player registrations spanning hundreds of communities from New York to Hawaii. Our franchise owners offer youth sports leagues, camps, and clinics for boys and girls ages 3 – 14 in today’s most popular sports such as flag football, soccer, basketball, and baseball. Since our first franchise was sold in 2003, i9 Sports has given entrepreneurial individuals who have the desire to make a living doing something they love a time-tested way to achieve their dreams. Why are so many entrepreneurs drawn to the i9 Sports franchise business opportunity? Aside from the appeal of sports and the ability to make a difference in the lives of kids, our model makes a huge difference in the lives of our franchise owners and their families! i9 Sports franchises are home-based and offer our franchise owners the freedom, work/life balance, and financial independence that only come through owning your own business. Join the team and earn a living doing something you enjoy! 9 Reasons Why You’ll Love i9 Sports! Home Based Business – Enjoy freedom, flexibility, and work/life balance. Low Investment/Low Cost of Entry – No real estate or upfront inventory. Huge Market Potential – Over 60 million kids play sports each year! Financial Independence – Take control of your future; write your own paycheck! Multiple Income Streams – Income from player entry fees, merchandise & more. Protected Territory – Exclusive rights to run multiple sports at multiple locations. Proprietary Technology – Manage almost every facet of your business from your laptop utilizing our industry-leading web-based technology. Nationally-Recognized Training & Support – Outstanding classroom and in-field training plus continual coaching and support throughout the life of your franchise. Community Impact – Make a difference in your community by helping kids succeed in life through sports. i9 Sports is Looking for Aspiring Business Owners Like You! No prior sports experience required. Simply liking sports is enough. Management aptitude. Proven ability to manage & delegate. Sales & marketing skills. Being detail-oriented is key. Committed to providing a superior customer experience. Highly self-motivated with a desire to succeed. Ready to step into a full-time career doing something you enjoy? Contact us to learn more! i9 Sports® is currently accepting inquiries from the following states: Wyoming, West Virginia, Wisconsin, Washington, Vermont, Virginia, Utah, Tennessee, South Carolina, Rhode Island, Pennsylvania, Oregon, Oklahoma, Ohio, New York, Nevada, New Mexico, New Jersey, New Hampshire, Nebraska, North Carolina, Montana, Mississippi, Missouri, Minnesota, Michigan, Maine, Maryland, Massachusetts, Louisiana, Kentucky, Kansas, Indiana, Illinois, Idaho, Iowa, Hawaii, Georgia, Florida, Delaware, Washington, D.C., Connecticut, Colorado, Arizona, Arkansas, Alabama, Alaska. Interested parties should have at least $50,000 in liquid capital to invest. @merideth_stull @weese_kim @WinningAngle @FAU_Football @FAUAthletics Way to go, Jax! !